We are an independent Australian owned Marine Survey company based in Perth WA. We provide reliable solutions to the offshore energy industry and Government sector. With a footprint across Australia, PNG, NZ and the broader Asia Pacific region we focus on delivering client projects efficiently and safely while reducing risk. If you need to measure or observe something in the marine environment you are in the right place, as our vessel assets combined with our Geophysical, Oceanographic and Project Management skills bring a fresh look to the survey industry in a region we all care about so much. Geophysical services for sites, routes and renewable studies are core business. We use latest generation multibeam, sub-bottom profilers, side scan sonars and magnetometers to ensure your assets and permits are thoroughly mapped to the highest possible standard. We provide offshore positioning services using the latest surface and underwater equipment integrated to the leading survey software. Our rigorous processes and procedures ensure reliable and accurate services on-time, every time. Hydrographic Surveys to IHO, LINZ, HIPP or your custom standard can be undertaken and delivered in a cost effective manner. Our in-house AHSCP Level 1 accredited surveyors ensure projects are delivered to the required standard suitable for submission to the Australian Hydrographic Office. Every project is backed by over a century of high level management experience, and the skilled people and teamwork required to bring our clients success. We provide specialised Geophysical equipment for our offshore Survey and Consultancy projects including state of the art multi beam echo sounders (MBES) and sonar. We provide quality marine survey solutions to the offshore energy industry and Government agencies that meet health, safety and environmental needs while impacting minimally on the environment and communities in which we operate. 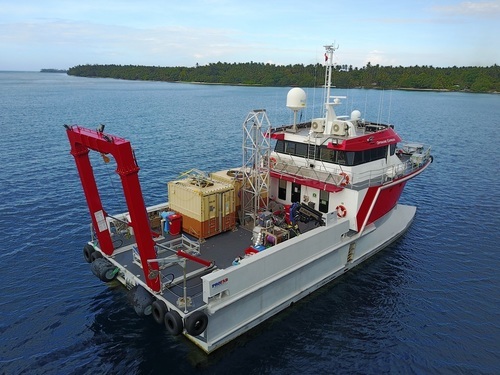 Guardian Geomatics is an Australian owned and operated marine surveying company servicing the offshore oil, gas and renewable markets in Australia and Asia Pacific. Alongside Guardian Offshore AU, Guardian Geomatics delivers professional high quality marine survey solutions and consulting.